Gloria W. Conlin was born in Houston, Texas on September 30, 1937, and moved to New Orleans when she was 13. Later, she married Arthur “Mike” Conlin, Jr. who began his career in teaching and coaching. They had three children, Tim, Colleen and Erin. Mike Conlin coached at schools in Louisiana, Mississippi and Alabama. In 1968, they were guests of Coach “Bear” Bryant for the University of Alabama’s spring football game. In 1970, Mike moved to Abbeville to coach and teach. They fell in love with the people and the Cajun culture. The Conlins would say, “some people are lucky enough to be born here.” They found this area to be full of the friendliest people on earth. The late Sen. Cecil Picard, then principal of Abbeville High and later the State Superintendent of Education, was the man who recruited Mike to come to work in Cajun country. When first arriving in Vermilion Parish, Gloria became a Girl Scout leader. Later, the Conlins provided a home for a young boy in need for one and one-half years. She was secretary of TRIAD, a Sheriff’s organization working with seniors. She was also a member of Keep Abbeville Beautiful. For a while Gloria and Mike left Abbeville, but soon returned to Cajun country in 2000. Mike passed away in 2003. 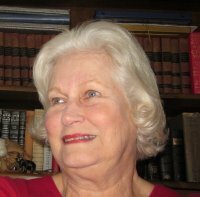 After Mike’s death Gloria was active as a member of the Vermilion Parish Library Foundation. She was part of a group of citizens that worked in order to insure a tax was renewed and the libraries of the parish were saved. Later, the Vermilion Parish Police Jury was to build a burn site less than two miles from Meaux Elementary School. Again the citizens of the community rallied against the move and stopped the burn site. Gloria began disseminating information around the state to keep school board members and teachers informed about various policies of the Department of Education. According to Conlin, the greatest challenge today is to preserve our Cajun culture and protect our land. For example, the people in Bayou Corne have been forced to leave their community much like the Acadians were driven off of their lands in 1755 by the British. Likewise, the people that live on or near Lake Peigneur do not want to be driven off their land by environmental dangers. Therefore, Conlin decided to get involved with many types of environmental issues. Still active, she uses her skills to send out information to protect the environment. For example, she used her communication skills to get out information on why natural gas salt dome caverns, the size of the New York Twin Towers, should not be expanded beneath Lake Peigneur.